The Soča River is a popular tourist destination, offering a wide variety of activities taking place on the water. Both kayaking and rafting are very popular, which makes it hard to choose – which is better for exploring the Soca River, kayak or raft? While there’s no wrong answer here, the best choice might be just trying both experiences! 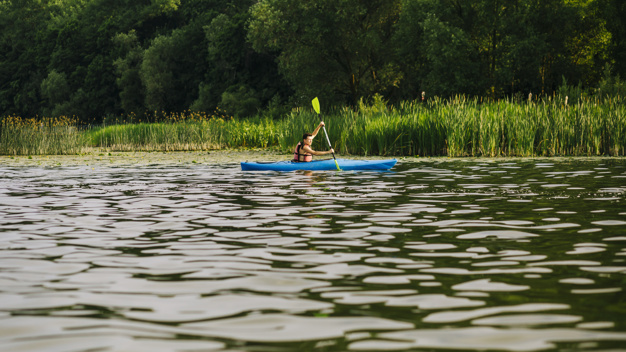 Kayaking is very popular, not only with tourists and explorers, but also with many professional kayakers or serious amateurs that come to the valley with exactly this intention. There’s no lack of options for either type – organized tours and even beginner schools are widely available in Bovec, Kobarid, and Tolmin, while the many put in points offer a wide variety of different experiences for those seeking to make an adventure on their own. Of course, the Soca River kayak for beginners offers the option to rent all the equipment needed, as well as transport to the entry and exit locations on the river. Soča rafting is just as popular, if not more. There are less rafters with their own rafts and solo adventures are not as popular. Rafting is not meant to be enjoyed as a solo activity, though, so this is understandable. Consequently, most of the attention is focused on group expeditions, ideal for families and other groups. Soča rafting is also more suitable for beginners, as it’s guided by a guide and the adventurists are left to enjoy the experience without any work to do. So, in theory, Soča rafting is ideal for groups and beginners, kayaking is more suitable for experienced kayakers and those willing to invest more time and effort. But with a wide variety of packages and options, the lines are somewhat blurred – everyone can find either rafting or kayaking adventure that will be ideal for them!